This superfood originated from Asia is now the most consumed citrus in the world. It can be turned into delicious juices, but is best consumed whole so as to keep all its nutrients and benefits. Bright, plump and bursting with flavour, oranges were offered as Christmas gifts in Victorian England. They also saved sailors’ lives and were considered medicinal during the Age of Discovering in the 15th century. Throughout history, oranges have been so amazingly popular that the colour was named after the fruit. Common oranges are known for being an excellent source of vitamin C (100g can provide over 60% of the recommended daily dose of this vitamin). Minerals like calcium, iron, magnesium, potassium, phosphorus and zinc are also present. These unique properties result in the ability to lower the risk of heart-related conditions, kidney stones, skin, lung or breast cancer (among others). 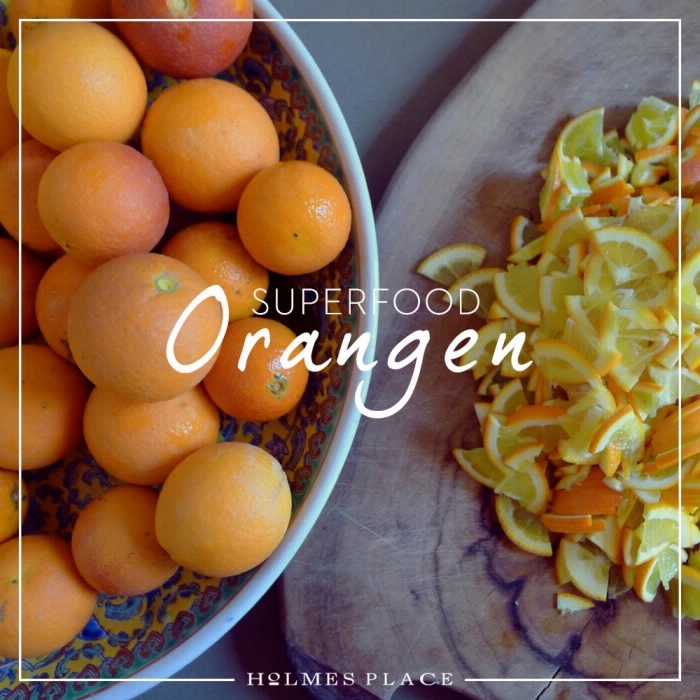 Oranges are widely known and praised for their ability to prevent colds, fight viral infections and promote good vision, due to its carotenoid compounds that help prevent macular degeneration. 100g of oranges has an average of 47 calories, including pulp and fibre. However, when consumed as juice, the sugar concentration can be higher than that of canned sodas - so nutritionists do discourage it. The best way to enjoy orange in its whole and pure form, but preserve for longer, is in a delicious marmalade jam. This recipe by Stacey from goodnessis.com inspired Anna. Using a small, sharp kitchen knife, cut the oranges and lemon in half and then in half again, so that you have quarters. Scoop out as many seeds as you can and then thinly slice each quarter into fine shreds (or thicker slices if you like a chunkier texture). Place the water, oranges and lemon shreds into a large stainless steel or enameled pan. Bring to the boil, then lower the heat so that the liquid continues to simmer. Simmer covered for 30 minutes. In intervals, lift the lid and scoop off any seeds you may have missed that have floated to the surface. Uncover, then add the sugar and simmer until the jam thickens and the peel is soft and translucent – about 40 minutes to 1 hour and a half. Mine took just over an hour. Ladle into sterilized pots and seal. You can also freeze the jars and defrost as needed. Because of the low sugar content, the jam needs to be kept in the fridge.